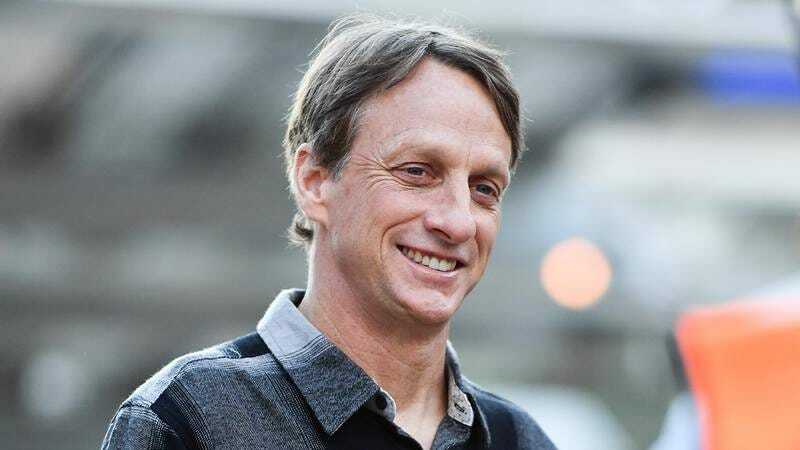 Tony Hawk’s name is synonymous with skateboarding, and rightfully so: Without him, skateboarding would still simply be a fringe street sport, as opposed to the global phenomenon it is today. We asked the legendary athlete five questions, and his answers will blow you away! 1. What do you like to do when you’re not skating? When I’m not skating, something I’ve gotten really into lately is those tiny finger skateboards. When my big, adult hand is on a tiny skateboard, it can grind on spoons, jump off of lamps, and even kickflip on my wife’s arms. These are places I, as a large human man, could never skateboard, so I get a lot of enjoyment out of it. 2. How has the skateboarding world changed in the last 20 years? I think the biggest difference nowadays is that my pet frog is dead. In the ’90s, when skateboarding was at its peak, my pet frog was extremely healthy and happy. But then the 2000s came, skateboarding became more culturally mainstream, and the poor guy swallowed a marble and was never the same again. He became very pale, and dry to the touch. He even bit me once. 3. What’s the first skateboard trick you ever learned? It’s called Sergeant McTwist’s Triple-Slippy Skull-Bungalo Doghouse 360. It would take too long to explain here, but if you saw it, it would blow your mind. 4. Do you ever play your Tony Hawk’s Pro Skater video games? I don’t really play them, but my kids do, and they love to turn on the game and immediately watch their dad ram into walls over and over again until he dies. They don’t even do any tricks! They just press start and smash my flailing body into objects repeatedly, and then the “Game Over” screen comes up. The last time they made me watch, and when my character died, I died in real life. It’s brutal. 5. What would you say to the young kids out there who have some talent, love to skateboard, but don’t think they’ve got what it takes to go pro? I’d say, “You never know!” I’d also say that Star Wars: Episode IX has a scene where Luke and Leia kiss again to see what it’s like now that they know they’re siblings. I know that isn’t a great answer for that question, but I wasn’t sure if I’d get a better opportunity, and I needed to get that off my chest. I found the script on the ground. I guess it had been blown out of Colin Trevorrow’s hand, and then he offered me a smooch on the cheek to keep it secret. But what do I want a smooch for? I’m Tony Hawk. I’m really shaken up about the whole experience, but still definitely interested to see how the movie turns out. Lord, have mercy on my soul.